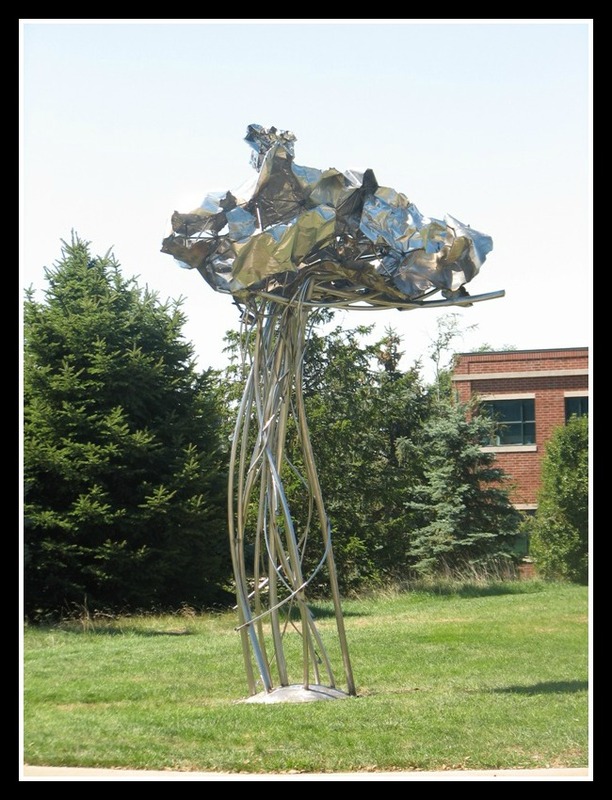 Please join the Public Art League in welcoming "Beautiful Storm," by Michael Gerald Helbing, to the University of Illinois Research Park. Mr. Helbing, of Berwyn, cites his inspiration for the 16' tall sculpture as the visual appeal of a thunderhead in the late afternoon when the sun lights up the otherwise black and heavy clouds as though it's playing with them. "Beautiful Storm" can now be enjoyed by those who work, visit and attend events in the Research Park. A big thank you to Fox/Atkins Development, LLC for becoming a site sponsor of the Public Art League and making it possible to bring this wonderful sculpture to the community. 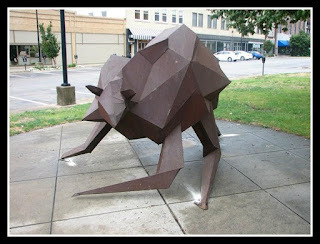 "Stride", by artist Beth Nybeck of Kansas City, now lives in front of the Orpheum Children's Museum in downtown Champaign. In describing the sculpture, the artist states, "The spirit of discovery is one that needs to be equipped with courage. The journey of uncovering the unknown is filled with fear and excitement. 'Stride' explores the awkward isolation of moving onward as a unique individual." Thank you to The Robeson Family Benefit Fund for the site sponsorship of this sculpture. In partnership with the City of Urbana Public Arts Commission, the Public Art League welcomes "Fortitude IV" by artist Mark Krucke of Garner, North Carolina. 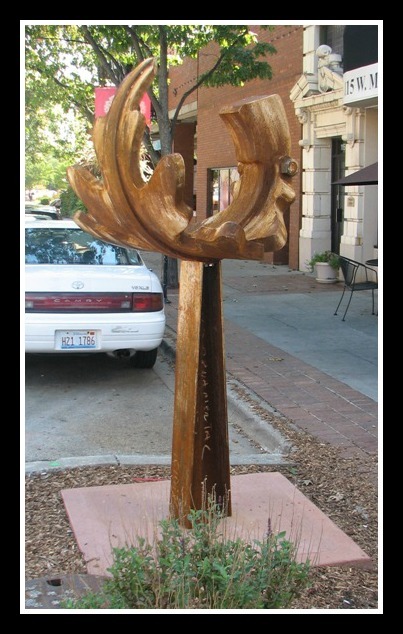 In celebration of its designation as a "Tree City USA", the sculpture has been installed on Main Street in Urbana's downtown. The sculpture is an oak leaf and is the fourth in a series by the artist that focuses on encompassing space with industrial materials. Thank you to the City of Urbana Public Arts Commission for site sponsorship of this piece. "Ice" is another wonderful sculpture by artist Michael Gerald Helbing of Berwyn, Illinois. The sculpture stands at 11 feet tall and has been installed in Mattis Park in Champaign. The sculpture is made from a stainless steel tank, cut and reassembled to form the crisp edges of a glacier. It is stiffened with tubes that represent running water. The metal has been ground so that it will sparkle in the light. 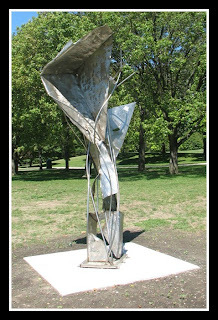 Thank you to the Champaign Parks Foundation for the site sponsorship of this sculpture. "Splintering Continuity" is another fantastic sculpture by artist Beth Nybeck of Kansas City, Missouri. 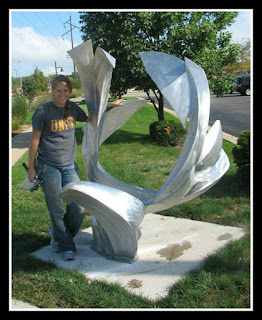 The piece has been installed at the corner of S. Philo Road and E. Colorado Avenue in Urbana. Regarding the sculpture, the artist states, "The pace with which we move through our world is a rapid one. The motion, the schedules, the deadlines, and the adrenaline that holds it all together makes some things appear crisp and others a complete blur. Splintering Continuity embodies the movement that one may get lost in." Thank you to the City of Urbana Public Arts Commission for the site sponsorship of this piece. "Remembering Horeb" can be found on Neil Street in downtown Champaign near Circles, Quality and the City Building. The sculpture is over 9 feet tall and was constructed using glacial granite, steel and stainless steel. The artist is Shawn Phillip Morin of Bowling Green, Ohio. Commenting on his career, Mr. Morin states that he has migrated through the figurative, the architectural, the abstract, and the spiritual in presentation. He now believes his work is a synthesis of all these styles. "Remembering Horeb" is available for site sponsorship. Please contact the Public Art League at info@publicartleague.org if you would like to sponsor the site for this wonderful piece.